Slow cooker Italian beef sandwiches are melt in your mouth tender with just a little tangy spice. This easy recipe has just two ingredients and simmers in the slow cooker all day so it’s ready when you are. For this recipe you’ll need: lean beef roast and peperoncini peppers. You’ll want to add sourdough sandwich rolls to make the sandwiches with. Everyone needs a fantastic recipe, that is super-simple, and is so delicious that everyone loves it. 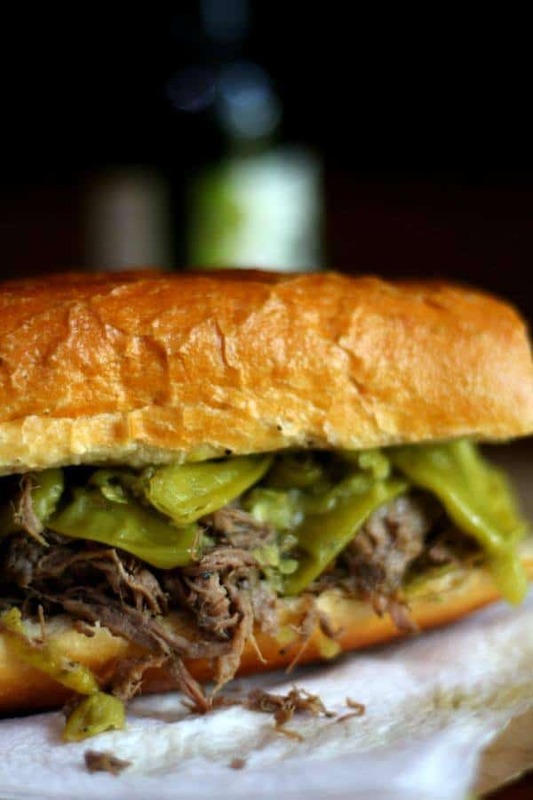 Slow Cooker Italian Beef Sandwiches, meet Restless Chipotle readers. 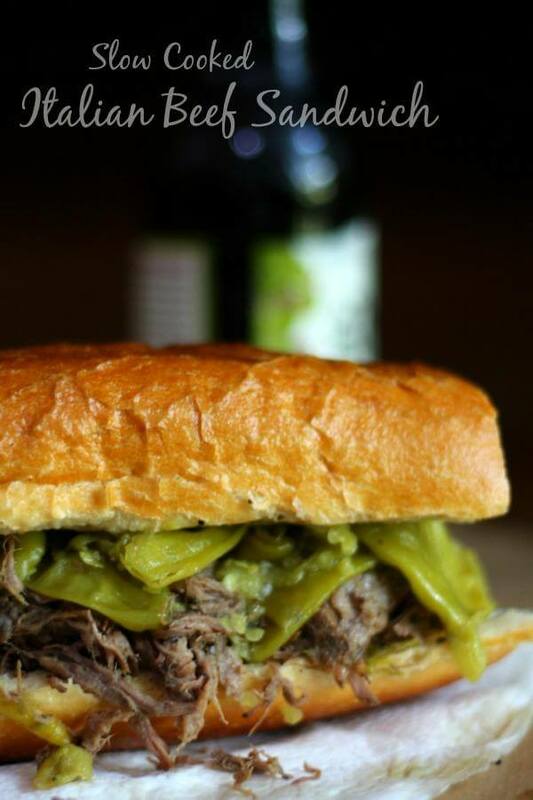 Restless Chipotle readers meet Slow Cooker Italian Beef Sandwiches. Two ingredients, people. TWO ingredients. I love using my slow cooker all year. In the winter it’s nice on busy days because you throw everything in in the morning and it’s ready when you get home. In the summer I may like it even better because it’s one way to keep the temperature in my kitchen from resembling Hell with the heat turned up when we’re having our sweltering 115F days here in Texas. The slow cooker definitely gets a lot of use around here. This is a casual meal. I like it for Sundays because it literally takes about 2 minutes to put together plus you can double it up easily to feed a crowd. These slow cooker Italian beef sandwiches are quite happy on a paper plate with a handful of chips on the side. Really, it couldn’t be easier. Cook the beef as long as possible in your slow cooker. I like to let it go 10 hours if I can. During that time the flavor of the other ingredient, peperoncini peppers, soaks into the meat giving it a vinegary bite and just a smidge of spicy heat. After about 8 hours I shred the meat and let it cook a little more in the juice for more flavor. Ring the dinner bell and let everyone pile that juicy, shredded beef up as high as it can go on a crispy sourdough baguette. Set out plates of caramelized onions, sautéed peppers, Provolone or whatever you like for family and guests to put on top. I usually go for just the beef or beef and onions. Garlic butter is amazing on these – just spread it on the bread before you put the beef on. In fact, I like to slice into the bread, gently open it, spread it with garlic butter, and then toast it before I add the beef. The crust gets crunchy, the bread is chewy and garlicky, and the beef is juicy and tangy. It’s a great combination and it only takes an extra couple of minutes. 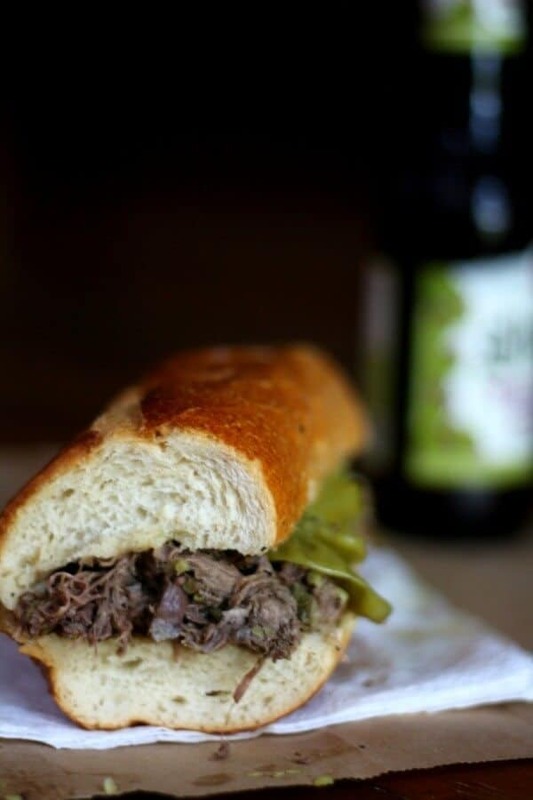 This would be an awesome shredded beef sandwich to serve for game days or Superbowl! They are hearty, filling, and family friendly — you just can’t get much better than that! If you are in the market for a new slow cooker I like this programmable slow cooker by Crockpot. It even keeps your dinner warm if you aren’t home right after it’s cooked! I used to use the sliced peperoncini but lately I’ve been using the whole ones. Why? Because I have some fussy eaters and it’s easier to pick the whole ones out of the meat than the sliced ones! If you are looking for sandwich recipes here are some of my favorites! This recipe is perfect for game day, weekends, potlucks… just about any time you want something delicious AND effortless! If you love this recipe please give it 5 stars. Spicy Italian beef sandwiches that are made in the slow cooker. These are great for Superbowl, casual meals, or family meals. Two ingredients - you can't get easier than this. 3 lbs beef roast - a lean cut works great but anything is o.k. Put it in a slow cooker and add the entire contents of the peperocini jar. After 7 hours shed the beef with 2 forks and then let it cook for at least another hour. This infuses the meat with even more flavor. Warm baguettes in the oven until crust is crispy. Cut in half and pile meat onto the bottom part. Add optional ingredients and add top of bread. This is even better the next day if it lasts that long. This is the original image from 2013. Go ahead and cringe… I did. Those look great, i’ll have to try it! I can’t believe just two ingredients! Mmmm….I’m drooling over these, and they sound fabulous with garlic butter! Can’t wait to try them! Good reminder for the bowl games! My husband’s favorite! 🙂 I love these things. I always keep a big jar of peppers in the fridge, because my husband loves to snack on them. He’d go nuts for this! Ok, two ingredients and a slow cooker… I’m in!! Love the idea of taking these to the next level with caramelized onions, peppers and provolone! It’s so easy! My family loves it!